The Street View Text (SVT) dataset was harvested from Google Street View. Image text in this data exhibits high variability and often has low resolution. In dealing with outdoor street level imagery, we note two characteristics. (1) Image text often comes from business signage and (2) business names are easily available through geographic business searches. 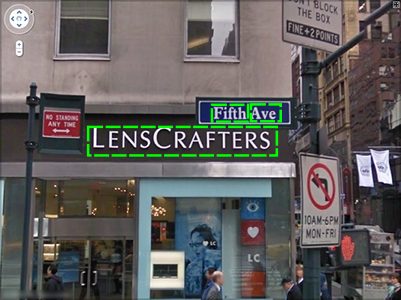 These factors make the SVT set uniquely suited for word spotting in the wild: given a street view image, the goal is to identify words from nearby businesses. More details about the data set can be found in our paper, Word Spotting in the Wild. For our up-to-date benchmarks on this data, see our paper, End-to-end Scene Text Recognition. This dataset only has word-level annotations (no character bounding boxes) and should be used for (A) cropped lexicon-driven word recognition and (B) full image lexicon-driven word detection and recognition. If you need character training data then you should look into the Chars74K and ICDAR datasets . Task: locate all the words in an image that appear in its lexicon. While there is other text in the image, only the lexicon words are to be detected. This contrasts from the more general OCR problem. Annotations are in XML using tags similar to those from ICDAR Robust Reading Competition. We used Amazon's Mechanical Turk to harvest and label the images from Google Street View. To build the data set, we created several Human Intelligence Tasks (HITs) to be completed on Mechanical Turk. Harvest images. Workers are assigned a unique city and are requested to acquire 20 images that contain text from Google Street view. 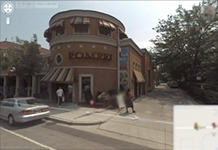 They were instructed to: (1) perform a Search Nearby:* on their city, (2) examine the businesses in the search results, and (3) look at the associated street view for images containing text from the business name. If words are found, they compose the scene to minimize skew, save a screen shot, and record the business name and address. Image annotation. Workers are presented with an image and a list of candidate words to label with bounding boxes. This contrasts with the ICDAR Robust Reading data set in that we only label words associated with businesses. We used Alex Sorokin's Annotation Toolkit to support bounding box image annotation. For each image, we obtained a list of local business names using the Search Nearby:* in Google Maps at the image's address. We stored the top 20 business results for each image, typically resulting in 50 unique words. 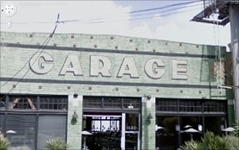 To summarize, the SVT data set consists of images collected from Google Street View, where each image is annotated with bounding boxes around words from businesses around where the image was taken. Kai Wang, Boris Babenko and Serge Belongie. For questions about the dataset please contact Kai Wang at k...@cs.ucsd.edu.